Deployments of 5G are starting to progress from discussion to reality, while Mobile Service Providers (MSPs) are still unclear where new revenues will come from. Surely there are discussions and aspirations for enterprise verticals that include transportation, healthcare, manufacturing, and smart cities, but no single MSP has announced — let alone deployed — a non-consumer business strategy that is not anchored in cellular connectivity. It is also not likely that 5G will revolutionize this domain in the first years of its deployment. MSPs can deploy these strategies today with 4G and the Narrowband Internet of Things (NB-IoT) but have not yet done so. It is a formidable task for MSPs to achieve this transformation alone, especially when the current value chain depends on a linear delivery of network technology. The 3rd Generation Partnership Project (3GPP) meets and crystallizes common consensus in formal standards. Vendors create equipment, software, and associated services that are compliant with these standards, which are then deployed in today’s cellular networks. It is clear that a change in an MSP’s business model needs to start at the very beginning of this process: 3GPP itself. 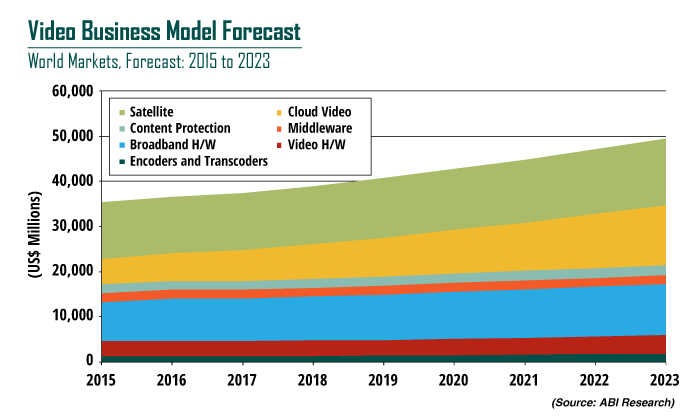 ABI Research forecasts the enterprise video solutions market to pass US$49 billion by 2023. While changes in viewer behavior and the shift from on-prem hardware to cloud services have posed challenges to some market segments such as encoders/transcoders, middleware, and conditional access (CAS), new opportunities in OTT and cloud video are adding fuel to the market — UHD and ongoing codec transitions (e.g., HEVC) will also help balance out declines and slowing growth in some pay TV markets. “Video services and operators are increasingly moving workflows and operations to the cloud — doing so allows companies to better scale operations both up and down to meet demand and helps lower CAPEX spend, particularly among those companies without extensive history in the OTT space. These changes also reflect the need for video platforms and services to be more flexible to meet the needs of a wider breadth of customers and, ultimately, end viewers,” explained Michael Inouye, Principal Analyst. Read more. The adoption of smart manufacturing technologies is growing in almost all industries within the leading manufacturing countries such as the United States, Japan, and Germany, and the automotive industry has been a pioneer for most technologies in each of them, finds ABI Research. “The automotive industry has been a pioneer in adopting many transformative technologies because it has more of a need and a demand to increase flexibility and agility,” explained Pierce Owen, Principal Analyst. These technologies include Additive Manufacturing (AM), Artificial Intelligence (AI) and Machine Learning (ML), Augmented Reality (AR), and Collaborative Robotics (cobots), as well as Industrial Internet of Things (IIoT) platforms. Some of the leading automotive Original Equipment Manufacturers (OEMs) including Audi, Volkswagen (VW), Ford, Honda, Daimler, and BMW have at least piloted and, in some cases, have scaled these technologies. Read more. “Hardware cost saving is one of the major advantages of cloud DVR services,” says analyst Khin Sandi Lynn. “With set-top box DVR, users need to replace the hardware when they need more storage. By using cloud DVR, service providers can save hardware costs by supplying a non-DVR box, while providing DVR features using cloud storage.” Read the full article. Where it’s previously been difficult for foreign startups to get Chinese VC funding, Chinese VCs are beginning to look at foreign-born startups with significant interest. According to a report by strategic research firm ABI Research, AI startups in China raised nearly $5 billion in venture capital funding in 2017, which PriceWaterhouseCoopers says accounted for 48 percent of the world’s total AI startup funding, compared to America’s 38 percent. Read the full article.